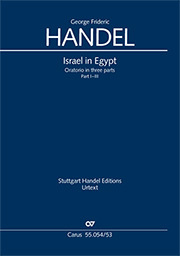 contains part II-III Israel in Egypt is one of the most popular of Handel’s oratorios, because of its large number of choruses, and has long enjoyed a firm place in the concert repertoire of many choirs. 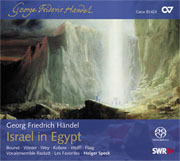 With its many movements scored for double choir, Israel in Egypt offers a widely-contrasting expressive spectrum, ranging from the expressive lament on the dramatic depictions of the plagues to the festive-triumphant rejoicing of the liberated Israelites. 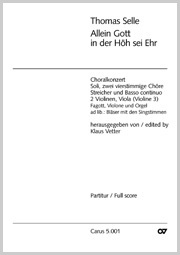 This outstanding work amongst Handel’s oratorios is available as a critical edition in the Stuttgart Handel Edition (Urtext). 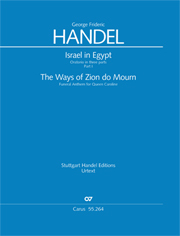 It contains the complete three-part version of the work of 1739. 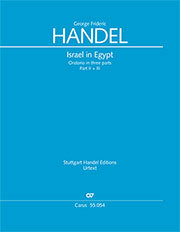 English musicologist Clifford Bartlett, an experienced specialist on the international early music scene, is the editor.